This Broccoli Chicken recipe is quick and easy to prepare and cook but packed with all the nutrition you may need. This is a perfect dish for a weeknight dinner and you can serve this dish with some cooked rice or even noodles. The chicken breast in this recipe has been velveted. “Velveting” a chicken breast can lock all the liquid in the meat and make the chicken breast taste better and give it a much softer and moist texture.You can have a look at the article “What is Velveting Chicken?” to get some ideas of what velvet chicken in Chinese is cooking and how to do it. Oyster sauce is one of the key seasonings for this dish. 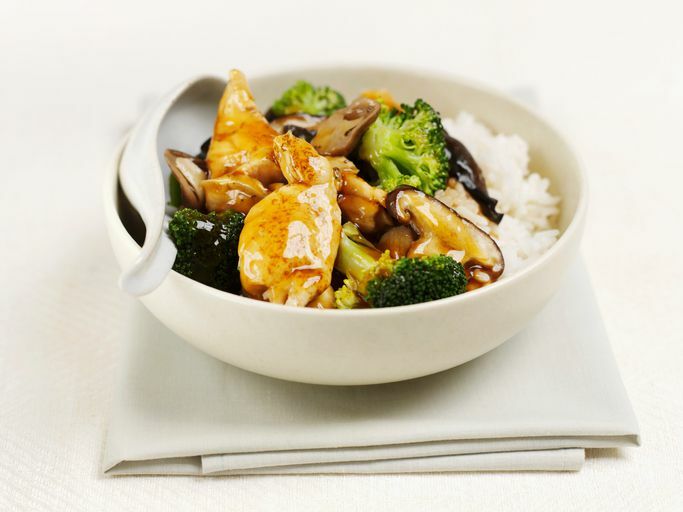 The chicken breast and broccoli pair very nicely with the oyster sauce. This recipe for broccoli chicken can serve 2-4 people. Cut the chicken into ¾ to 1-inch cubes. In a bowl, mix together the egg white, cornstarch and salt. Add the egg white mixture to the chicken cubes, tossing or using your fingers to coat the chicken in the mixture. Marinate the velveted chicken in a sealed container in the refrigerator for 30 minutes. While the chicken is marinating, prepare the sauce and vegetables: for the sauce, mix together the oyster sauce, light soy sauce, dark soy sauce, and water in a small bowl and set aside. Wash and drain the broccoli. Cut the stalks diagonally into thin slices. Cut the flowerets into 3 or 4 pieces. Crush the garlic. Heat up 2 cups of oil in a wok until it reaches 275 degrees Fahrenheit (test the heat by placing a piece of chicken in the wok – it should float). Add the chicken cubes, and let cook until they just turn white (this will take about 30 seconds), using a wooden spoon or chopsticks to gently separate them. Quickly remove the chicken cubes from the wok as soon as they turn white, and drain in a colander or on paper towels. Drain the oil out of the wok or preheat a second wok on medium high to high heat. Add 2 tablespoons oil. When the oil is hot, add the crushed garlic and stir fry for 10 seconds. Add ½ cup water, and cook the broccoli, covered, for 4-5 minutes, until it turns a bright green and is tender but still crisp. Remove from the wok and drain. Clean out the wok and heat 2 more tablespoons of oil. Add the broccoli and the velveted chicken, stirring and tossing to cook the chicken through. Add the sauce and cornstarch mixture in the middle of the wok and stir quickly to thicken. Mix everything together and serve hot over steamed rice.